IMIâ€™s Basic Marina Operations Training Guide will be provided both in hard-copy and in electronic form, and is a training program directed towards entry-level staff and seasonal help. This manual was developed using the British Marine Federationâ€™s basic training program and was edited to convert all modules for use in domestic operations. 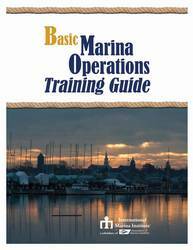 The objective of the Basic Marina Operations Training Guide is to deliver marina-specific skills and knowledge to workers in marinas and, where appropriate, boatyards. Most of the modules are designed to be completed at or near to the employeeâ€™s place of work and is a self guided program that the operator completes under the guidance of their manager. Clear guidance notes are included for both the operator and the manager. Please read these before embarking on the course. The syllabus content is covered in the 'Index of Modules' and is intended to cover all the subjects needed for operator to work with confidence and competence. It is also intended to provide guidelines for the employer and a record of training and achievement for regulatory compliance and records documentation. Training should begin on the first day of employment as there are subjects that should be covered during employee orientation. The operator has 12 months to complete the course; this course can be embedded into your organizations overall training program. It is recommended that the training section of the AMI/IMI Marina Operations Manual (MOM) be reviewed and utilized in the development of the marinaâ€™s training program, using the training chapter in the MOM. The course is divided into Mandatory and Optional Modules. Marina Operators must complete all of the Mandatory Modules and at least one of the Optional Modules.